Christians can always stand to learn something from other religions. If something is true, it’s true. And therefore beneficial. Especially since Christianity and Judaism share the same roots, there is a good amount of beneficial truth that these religions can find in the other. I was talking with a friend recently about the Chick-Fil-A controversy, and how so many Christians can rally together in defense of an idea, but can’t seem to so readily rally together in a matter of practice. As much as I get annoyed with some of the memes out there, that one that was passed around on Facebook during all this did have a point. Look at all the crowds clogging the Chick-Fil-A grounds, it said. Do you ever see this sort of thing at places where Christians should be serving the poor–the sort of thing that Jesus actually said to do? I said to my friend that what Christians could stand to learn from Judaism is that as concerned as it is with truth, it does not dwell on the ideological to the point that it neglects the practical. The Talmud is largely a record of a bunch of Rabbis arguing, but their argument tends to not be about mere ideas but about how best to live and to act as Jews. It appears in this thought world that whatever you may believe and how you understand something is largely up to you — it’s what you’re doing that is important. In other words, say “right or wrong” to a Jew and he or she will probably think of actions. It is becoming increasingly more likely nowadays that if you say “right or wrong” to a Christian he or she will probably think of ideas. This is why in many Christian circles solid belief in the Trinity, for example, is valued more as a tell-tale sign of proper faith than say sharing your possessions or praying with any regularity. The same culprit is responsible for this great irony: Many Christians defend with fervor the idea that the Bible is nothing less than the inspired, infallible, inerrant Word of God itself. But so few of them actually read it. We slack on practice to the point that it’s ok if its virtually non-existent. But we stress ideology to the point that we can’t often tolerate different views within the church. “Judaism, to a unique degree among historic religions, has cherished and encouraged freedom of thought … Jewish theological opinion has always ranged far and wide … The Jewish religion is highly intellectualistic in the sense that it places understanding among its supreme purposes, and in the further sense that it believes in knowledge as a key to understanding” (35). So, Judaism places a proper importance on ideas and is comfortable enough with ideas to allow a good deal of wiggle room when it comes to what to believe about certain topics. 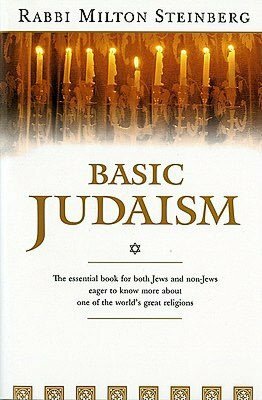 Steinberg continues:”And so where other historic religions have used themselves with doctrine first and ethic second, Judaism has done just the opposite” (35). I’m afraid Steinberg has Christianity in mind here. And I would dissent with his implication that we should have ethics first and doctrine second. I would advocate a theology where doctrine and ethic are hardly distinguishable (as Ben Witherington III has done in The Indelible Image). But nonetheless, at least in his point Steinberg raises the question and takes a stance on the true significance of what is done over against what is simply believed. And here Christians can, and should, find a series of important lessons. In light of the Chick-Fil-A controversy, one of these lessons is how to approach the topic of right and wrong actions. If Steinberg helps provide us with a balanced way of thinking about doing and believing, what’s a more balanced view of wrong? From his Jewish point of view, he writes:”With sin as with evil the Tradition is far more concerned that men act rightly than that they shall speculate in some approved fashion” (87). What’s more important? Speculation about what is wrong (and spewing that speculation on anyone who might hear you), or actually doing the opposite of what is wrong? So, yes, it’s certainly a valid question: What good are we if we do not actually believe in what we do? This is admittedly crucial. But, more to the point at hand, What purpose do we serve if we do not do what we actually believe? One last question: What do we actually believe in the first place? I so appreciate your thoughtful outlook on things. You are a haven of reason and practicality when it comes to faith, which I regret to say can sometimes be hard to find. Loved this post! Thanks so much Michelle! With that kind of encouragement I’m going to keep on writing! Michelle suggested I take a look at this post. Good reasoning, no pun intended! 🙂 The Hebrews and Judaism are credited by many historians as being the first to give the world the idea of social justice, which is action, not just thought, and societal, not just personal. Definitely keep writing! Thanks so much for stopping by James! Just after this section in the book Steinberg provides some confirmation that social justice and the like is a hallmark of Jewish practice. Thanks for the encouragement!